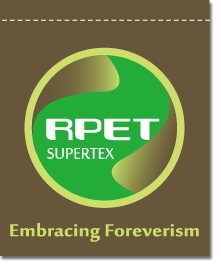 In 2011, we have received the Taiwan Green Classics Award for RPET (recycled PET bottle fabrics) products, but we provided not only fabrics for years. We can do something more, from material to finished products. We provide a total service chain for example, design, manufacture, transport etc to our customers, and help them to decrease the cost, energy or travel expenses. It is a total solution service, and this is the reason why we have the Taiwan Green Classics awards again.